As I have tweeted since there are *many* words that I would use to describe Southern Health’s business intelligence strategy and visionary is most certainly not one of them. Negligent? Risky? PR-driven? Too little, too late? From French tableau, from Old French tablel ‎(“a surface which is used primarily for painting”). There is just so much wrong with this ‘customer story’ it is actually a work of fiction, even allowing for PR/creative license. Southern Health are using tableau to simply ‘paint a picture’ that bears no resemblance to reality. @GeorgeJulian We'd love to hear more about your request. Will you email social@tableau.com? I asked Tableau if they could connect me with just one commentator that described Southern Health as visionary. They said they’d love to hear more about my request and asked me to email them. Here goes…. I recently read an article on your website here. It is called ‘Southern Health: Informed analytics from the ward to the board’ which is a great catchy title. Except there’s a small problem in that there’s no evidence that this is actually happening, just what could theoretically happen. 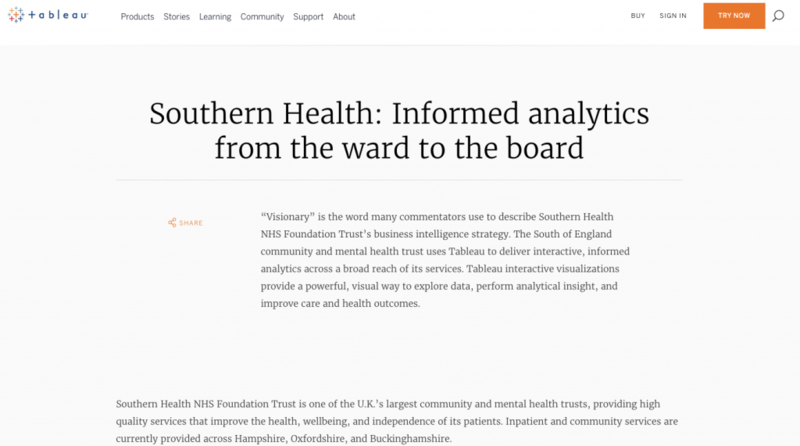 Your advertorial goes on to state ‘“Visionary” is the word many commentators use to describe Southern Health NHS Foundation Trust’s business intelligence strategy’. This was the crux of my request really, please could you put me in touch with any commentator who has described Southern Health’s business intelligence strategy as visionary? You say ‘many commentators’ describe it as such, so I’m sure putting me in touch with one or two wont be difficult. The piece then goes on to talk about how Southern Health provide ‘high quality services that improve the health, wellbeing, and independence of its patients‘. This isn’t actually true. There are two regulators who monitor the services that Southern Health provide. 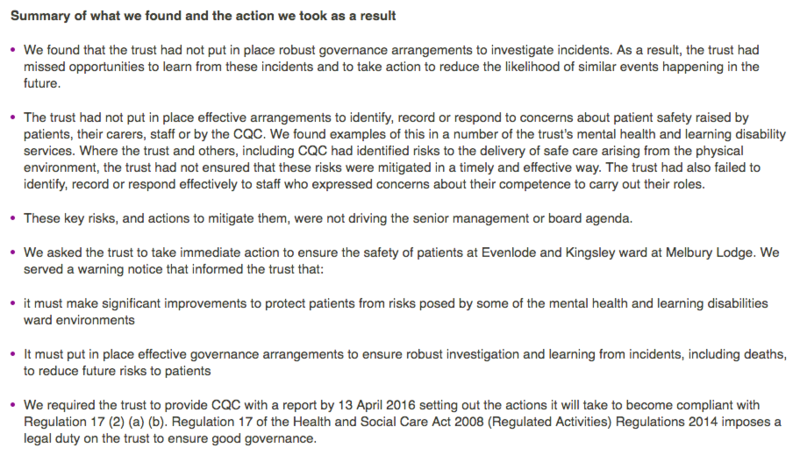 One of them, the Care Quality Commission, has rated the Trust as ‘requiring improvement‘, (which is one step away from being in special measures – they weren’t rated as good, or indeed as outstanding). The most recent inspection saw the CQC, and Monitor/NHS Improvement (the other regulator) having to take action to put restrictions on Southern Health’s licence, because they were so poor. A lack of leadership, focus and sufficient time spent in the Trust on carefully reporting and investigating unexpected deaths of Mental Health and Learning Disability service users. 30% of all deaths (those reported as expected and unexpected) in Adult Mental Health services were investigated as a CIR or SIRI, less than 1% of deaths in Learning Disability services were investigated as a CIR or SIRI and 0.3% of all deaths of Older People in Mental Health services were investigated as a SIRI. The Trust could not demonstrate a comprehensive, systematic approach to learning from deaths as evidenced by action plans, board review and follow up, high quality thematic reviews and resultant service change. The involvement of families and carers has been limited – 64% of investigations did not involve the family. Initial management assessments and investigations did not involve other service providers where this would have been appropriate. Despite the Trust having comprehensive data relating to deaths of its service users it has failed to use it effectively to understand mortality and issues relating to deaths of its Mental Health or Learning Disability service users. So it’s really rather hard to see how any of the claims in your article are true. While Tableau may indeed provide a solution to some of Southern Health’s problems, and while in theory it could potentially contribute to improved patient safety, there is no evidence that it is doing any of that yet. Your claims are inaccurate and highly offensive to the hundreds of bereaved families whose loved ones have been subjected to sub-standard care by Southern Health, which in some cases definitely cost them their lives, such as in LB’s case. You can read what a jury found at his inquest in full here. If you’re short on time they found he died as a result of neglect at Southern Health, a fit and healthy 18 year old. Woke up this morning to a reply to my email from Tableau. Thank you for your perspective on the customer story we have published on our website. We will continue to monitor the situation you raised. Also, from an editorial perspective, we will remove any unattributed quotes, as that is not in keeping our practices. If you now visit their website they’ve removed the headline fiction at the start of the article. A swift bit of action, small but swift. The second time this week that having challenged people about the sense of what they’re saying/doing given the overwhelming evidence that it’s just not right (the first was HCUK Conference which removed a Katrina Percy quote from their advertising, and removed Chris Gordon from their ‘Learning from Mazars’ Conference programme). It’s really heartening to see people make change and remove offensive fiction. Soul destroying to imagine for how many years we’ll need to provide this level of scrutiny into lies and spin (see Sara’s latest blog post about their highly offensive faux research with no research ethics approval), but then again heartening when people reflect on their own practice. d) humility (lack of). Perhaps they could stop selling their (appalling wares) and massaging egos at conferences around the country, and spend that time doing, you know, their day jobs. I’m sure their patients would appreciate it.